The Shanghai Composite Index outpaced all major market performance over the last 12 months. Its 110 percent climb over that span has been a product of speculation, excessive leverage, and irrational exuberance defying economic fundamentals. Incremental efforts by China’s securities regulator to cool off the stock market haven’t produced meaningful impact, leading some analysts to believe that more draconian intervention is in store. Such action could rattle the markets and severely increase volatility going forward. Most of the Shanghai Composite’s appreciation was achieved in the last six months, with a 91 percent gain. The rally is gaining momentum at a pace not seen since June 2005, when a similar advance preceded the late-2007 Shanghai stock market crash. 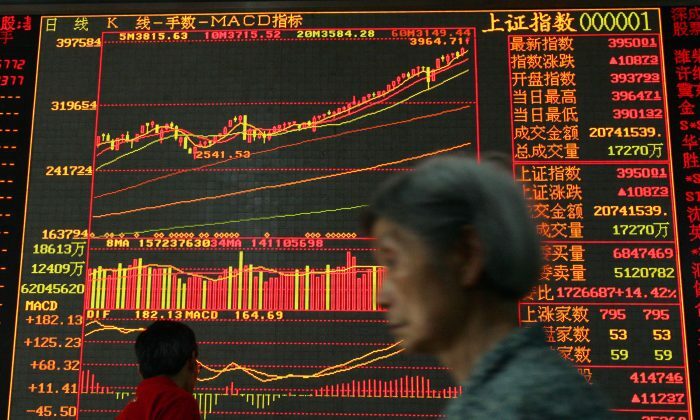 The amount of daily trading activity on the Shanghai Stock Exchange exceeded 1 trillion yuan ($161 billion) for the first time in history on April 21, and the exchange’s computers were unable to display the amount as the software did not have that many zeroes, underscoring the quick pace of the recent trading growth. The recent surge is fueled mostly by small-time retail investors, not professionals or institutions. As China’s real estate market flattened after 15 years of gains, mom and pop investors looked for a new place to make money. China Household Finance Survey, a survey of Chinese household income by the Southwestern University of Finance and Economics in Chengdu, Sichuan Province, found that most of the market’s new money came from relatively uneducated investors. The survey, conducted at the end of 2014, found that most new stock market investors in China lacked a high school degree and had relatively low net worth. The survey found that among the new trading account applicants, 67 percent listed junior high school as the highest education level completed. More than 30 percent only completed elementary school. And these investors are opening new trading accounts with zeal. Bloomberg reported on April 23 that the amount of new A-share brokerage account openings reached 3.25 million in just the previous week, more than double the weekly account openings in early to mid-2007 preceding the last stock market crash. Investors are also increasingly buying on borrowed funds. According to the China Securities Regulatory Commission (CSRC), as of April 10 a record 1.6 trillion yuan was lent to retail investors on margin. Buying on margin means borrowing money from the broker to buy stock, which lets investors buy more shares than they can afford, thus amplifying returns. But as stock prices decline, investors’ losses also amplify, and they must deposit more cash to meet minimum account values, otherwise known as a margin call. The Household Finance Survey found that among investors with experience investing in real estate, their expectations on stock prices are far higher than their expectations on the property market. That means the same speculators who poured money into real estate investments a decade ago are now squarely focused on stocks. And that unchecked enthusiasm has Chinese regulators worried. Earlier this year, China launched the Shanghai-Hong Kong Stock Connect, giving international investors in Hong Kong access to Shanghai Stock Exchange. Short selling, or betting against the price of a stock, was allowed in early March as another way to encourage experienced foreign traders in Hong Kong to assist in quelling the overheating Shanghai market. While the idea was sound in theory, in practice foreign institutional investors had few practical ways of shorting Shanghai shares. A short seller generally borrows the shares to sell, anticipating a drop in price to repurchase the same stock later. The Stock Connect mandated that shares can only be lent by exchange-registered brokers, but they usually had few shares to lend. In the end, the Stock Connect not only failed to attract any short sellers, but did the opposite by introducing rabid Chinese retail investors to the Hong Kong Stock Exchange who proceeded to bid up share prices there. In early April, China Securities Regulatory Commission levied penalties on six brokerages, including major players Huatai Securities Co. and Great Wall Securities Co. for violating margin-finance guidelines, such as not enforcing certain repayment rules and selling services to unqualified investors. Punishment varied by company, but Great Wall was barred from adding margin accounts for three months. The action comes after three brokerage firms were punished for violating similar margin financing rules in January. Some analysts are already sounding the alarm. China’s recent stock market surge is “a microcosm for the overall economy: unsustainable growth in leverage masking ever-deteriorating fundamentals and increasing future downside risks,” wrote BNP Paribas last month in a note to clients. Market veterans know that when it comes to stocks, the quicker the climb, the steeper the fall. The Shanghai Composite Index fell from a high of 5,903 on Oct. 12, 2007, to 1,729 on Oct. 31, 2008, a 71 percent drop in mere 12 months. In 2007, fewer retail investors were invested in the Chinese stock market. Today, the Chinese regime is looking to avoid such a catastrophe—a crash would wreak havoc on its already tenuous hold on social stability among the lower and middle classes. But if incremental limits don’t quell the hot market, regulators may resort to more drastic intervention. Either way, investors should brace for bigger volatility ahead for Chinese stocks. Chinese have embraced capitalism more than their Western brethren, or so the saying goes. Rampant speculation in the stock market is a testimony to this claim. A raft of reforms must be enacted to escape economic stagnation in China, according to the finance minister.